For me, making a map is the best stimulant for building worlds and telling stories. But there are many kinds of maps. Here are a few types I've developed for Dinotopia. 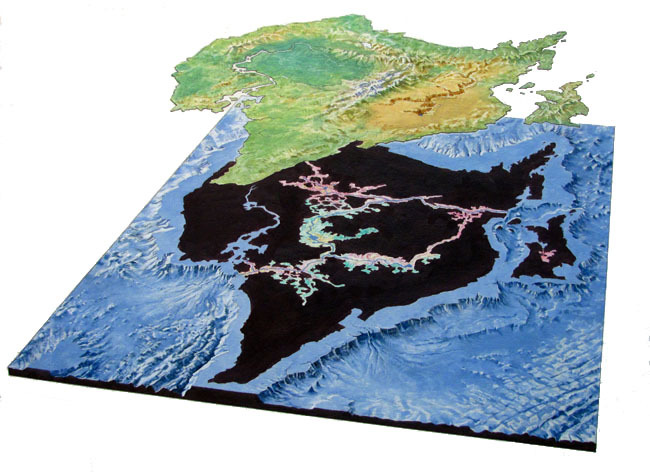 Physical geography map, with emphasis on landform relief. Painted in oil on board. 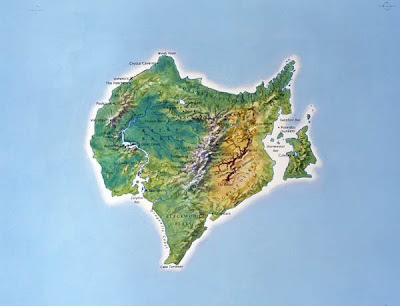 Seafloor relief, shown in perspective, with the island lifted up to show the caves. Inspired by the 1960s seafloor renderings by Tibor Toth for National Geographic. 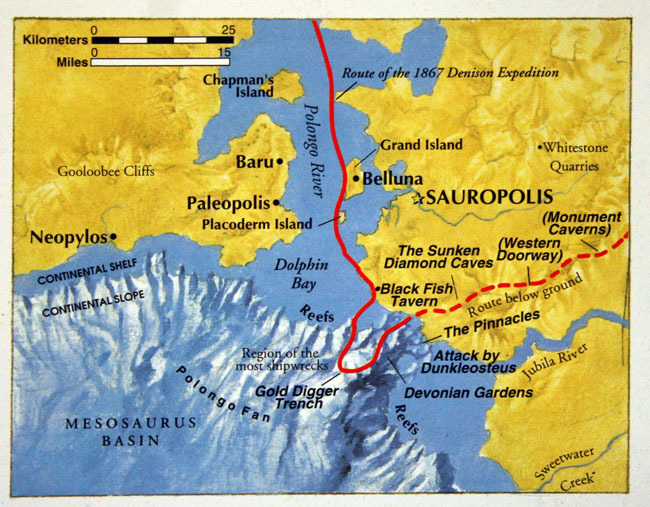 Expedition route map. I developed a rough version of this along with the story outline. The final is in oil, about the size of a postcard. The seafloor texture is drybrushed over white board, a fast way to work. Another route map showing a close-up section of the eastern coastline. The locator map at upper left places the detail map in context. 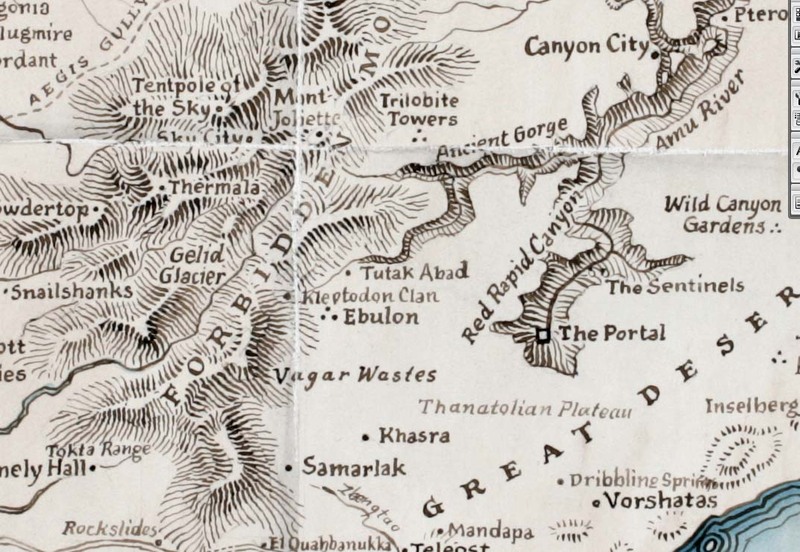 Antique maps are more convincing if they're made with antique tools. This one is made with a dip pen and brown ink on smooth watercolor board. The watercolor washes around the coast were laid down first when it was in pencil stage. Here's a close-up of the map above to show the graded hatching of the mountain reliefs, typical of engraved maps of the 17th, 18th, and early 19th centuries. Traveler's maps were often folded, so I abraded some fold lines into the surface. Here's a hand-drawn and hand-lettered city map drawn in ink, with a flourished title block and a "rubber stamp" suggesting its provenance in a museum collection. The lettering is not on an overlay, so I couldn't make mistakes. 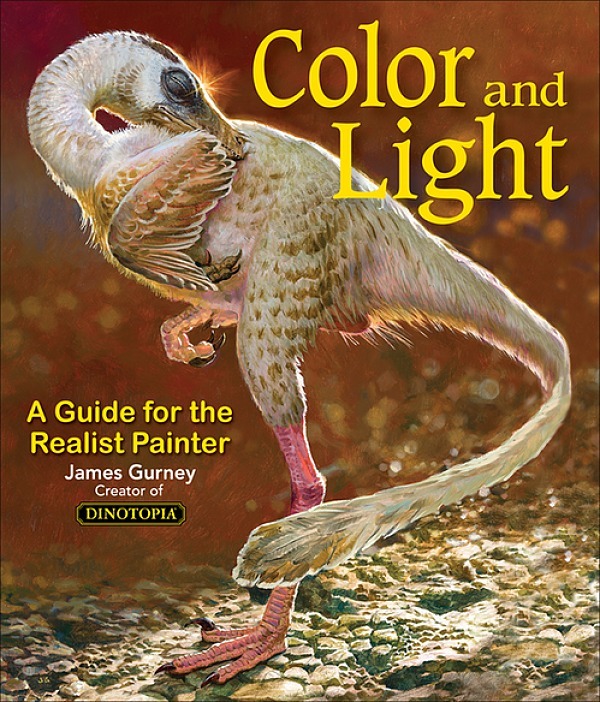 This is from Dinotopia: Journey to Chandara. 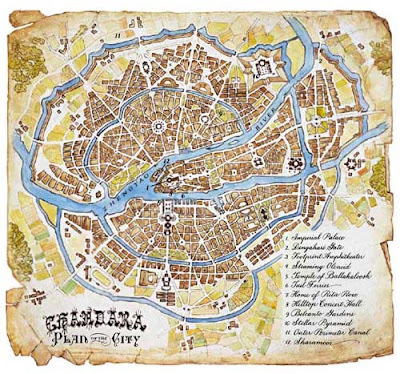 City map of Chandara, showing organic street grid and canals. 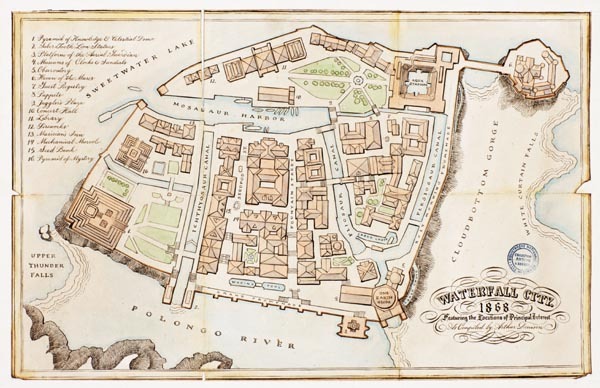 All sorts of street perspectives can be plotted from a master map like this. Here's a close-up of the same city in Dinotopia. This is called a building plan, where the buildings are sliced away a little above the ground. Walls are lines and columns are dots. Note the fancy illustrated title block, an exuberant touch that expresses something about the confidence of the city. 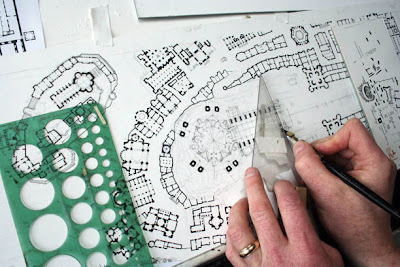 I love computer tools, but at the same time I also love the risk and commitment required by dip pens, circle templates, triangles, ruling pens, ships curves, and parallel rules. I used them because I thought they would give the final result a more authentic flavor. All of these maps have been exhibited in museum shows of Dinotopia artwork. Because they are hand-drawn and hand-painted physical objects, they take on a tangible presence, and they become valuable touchstones in the history and life of an intellectual property. 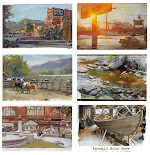 These are all beautifully rendered. What method did you use to artificially age the edges? Great post!! I'm excited to hear about the new blog. Worldbuilding is what excites me so much about illustration and concept art - I love all the ways in which one can flesh out an imaginary world. 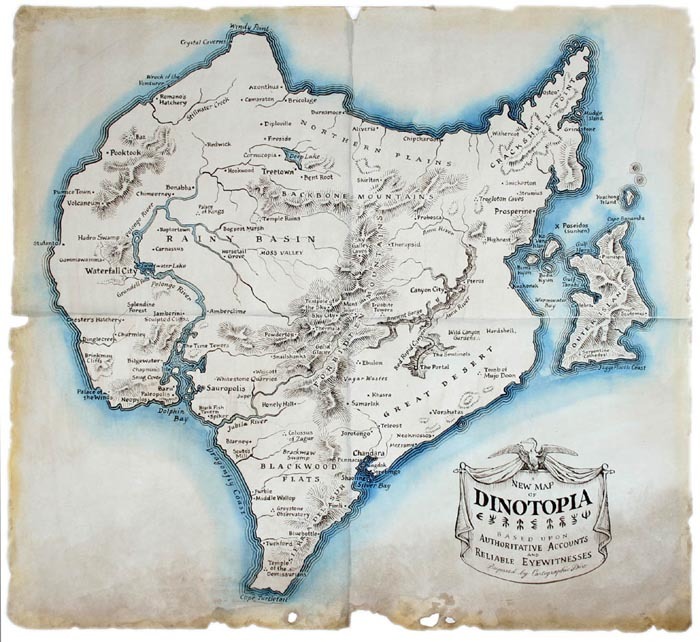 I remember poring over all the Dinotopia maps when I was younger - they were truly feasts for the imagination! looking at them was sort of related to how a pencil and paper made me feel. 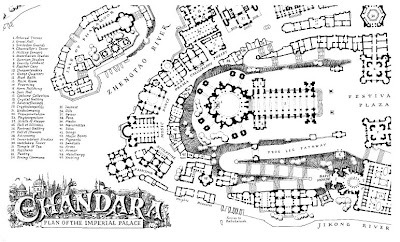 The maps are one of my favorite aspects of the Dinotopia books. They really make it seem real, like you could actually walk the streets and explore the landscape. Worldbuilding is basically what got me into doing concept art. From the first time I saw this map, I was struck by how much the island shape reminded me of a triceratops skull. Wow. That's pretty cool. One of my favorite hobbies is drawing maps.